Pen Sovann’s political history stretches across much of the worst and most violent moments of modern Cambodian history and yet now he is hardly remembered by this generation. His picture was in every classroom across the country until one day “it just wasn’t there,” as Somaly, a former propagandist for the People’s Republic of Kampuchea, who was just a teenager in 1979, remembered. Pen Sovann was born in Chan Teap Village on April 15, 1936, the year the first Khmer-language newspaper Nagaravatta started publishing. His family were simple subsistence farmers who worked the land year after year and were not educated much beyond the simple standards of the times. Although by no means well off, the Pen family was able to provide for themselves, seven children and both parents, without fear of starvation or going into debt, by the hard work of planting and harvesting rice. The family was atypical of most rural Cambodian families. All members of the family would contribute during harvest and planting. The children would be assigned different tasks throughout the year such as watching the cows, feeding the chickens, gathering wood, collecting fruit, catching fish or crabs, sewing clothes, and taking goods to the market. But all that ended on the day Pen Sovann’s father was seized by the French to work as a coolie, building bridges and dikes, staking out telegraph and telephone poles, and cutting timber. His absence from the family crippled them. Sovann said, “It was very hard on my mother. Very hard.” The first fires of hatred towards colonialism were kindled in the family once starvation began. Throughout the 1940s, a movement against the French, and against Khmer “puppets” of the French, became active. The movement was known as the Khmer Issarak (“Independent Khmer”), and in the early 1950s Prince Sihanouk began referring to all Issaraks as the Khmer Viet Minh, which was a title claimed only by guerillas along the Vietnamese border. The Issarak platform of operations centered on armed resistance to French rule, total national independence, and strong nationalism, although in the very beginning they focused mainly on anti-French propaganda in the then-Thai-controlled provinces of Siem Reap and Battambang. From the onset, there was strong Thai support for the movement, and in August 1946 the Issarak launched an attack on the city of Siem Reap from the Thai-controlled countryside, killing many French soldiers and occupying the ancient temples in the area before retreating a week later. Diplomatic pressure from the United States, coupled with Thai desire to be admitted into the newly founded United Nations, brought about the return of the two Thai-held provinces to the French. Yet support for the Issaraks by the Thai continued until the end of the 1940s. By 1949, direct French control over much of the administration of the Cambodian political structure had been relinquished to members of the royal government. Although still not declared an independent country, many of the daily decisions were made by Cambodians, with the French advising. This in turn began to hinder the growth of the Issarak movement, and created openings in a few Issarak units to French manipulation aimed at getting them to attack the Viet Minh, whom the French saw as a much more dangerous enemy. They were willing to supply and support these former enemies of their regime if they could be turned on “national” grounds against the primary enemies of the French. Although French support for the Issaraks was not all-encompassing, a small number of units did defect, and take up arms against their former Vietnamese comrades. Even with large shifts in political structure and the formation of new parties, the war against “the colonizers” continued unabated. The less than complete independence awarded Cambodia by the French on November 9, 1953, was disregarded, and the revolutionaries fought on until the Geneva Conference convened in May 1954 to settle the conflicts raging in Indochina. Even though the combined forces of the United Issarak Front and Vietnamese Volunteer Army in Kampuchea controlled and laid claim to more than one-third of the entire nation’s countryside, the UIF representatives Keo Moni and Mey Pho were strikingly excluded from the Conference. When a request was made by officials from the Democratic Republic of Vietnam to include representatives of the Pathet Lao and the Khmer Issaraks, the head of the Cambodian delegation, Sam Sary, assertively claimed that the Issaraks did not constitute a government and was quoted as saying that they were “foreigners who are being manipulated by a foreign bloc.” The terms of the Indochina settlement stated that all Viet Minh forces would withdraw from Laos and Cambodia. However, the United Issarak Front were not granted regroupment zones as were their Vietnamese and Laotian partners, and instead were ordered immediately to disarm and prepare to take part in the national elections of 1955. This left a bitter feeling of resentment and disappointment towards the Vietnamese in the hearts of some Khmer revolutionaries—in particular those revolutionaries returning from France, such as Saloth Sar, Ieng Sary, and Noun Chea. While the “Hanoi 1,000,” as the Khmer who joined the Viet Minh were known, were receiving military, political, ideological, and economic training, the radical movement back home was going through their own “era of political struggle,” as certain Asian scholars have called it. This era lasted from the conclusion of the Geneva Accords in 1954 to the peasant insurrection in Samlaut, Battambang in April 1967, which can be seen as one of the first acts of the soon raging civil war. Throughout the early 1950s before “independence” in 1953, many new political parties were formed, vying for power within the political freedom permitted by the French and hoping to repeat their success at winning assembly seats in the national elections of 1951 just as they had in 1947 and ‘48. These parties were: the Democrats, a party hated mutually by the French and Sihanouk for their populist platform, emphasis on independence, and seemingly large following among the educated and intellectuals; the Liberals, a party with no national program and an eagerness to collect French subventions; the Victorious Northeast, a party ruled by the overlord of Siem Reap province, Dap Chhuoun; and the Renovation Party, a monarchist party founded in 1947 as a counter to the “radical” ideas of the Democrats, which included Lon Nol, the president of the Khmer Republic from 1970 to 1975. There were also many other small parties involved in electioneering for the 1951 elections, but no parties except those mentioned won any seats in the national assembly. Fearing a loss of political power, Prince Sihanouk decided to circumvent the entire electoral process in 1955, and used his monarchist privileges to call for a referendum among the Cambodian people. The referendum gave the Cambodian voters the choice of voting for the King, “if you love him,” and voting against the King, “if you don’t love him.” Once all the votes were tallied up, there were 925,667 votes notched for the King and a near-insignificant 1,834 against. The results empowered Sihanouk to tackle his political opponents and within hours he had ordered the arrest of many editors of Cambodian newspapers. Those arrested had questioned his claim to have single-handedly won independence in 1953, as opposed to the much more realistic independence won through the Geneva Accords of 1954. The arrests were a precursor to the much wider purges to come after Sihanouk abdicated the throne and his “Buddhist socialism,” Sangkum Reastr Niyum, evolved into a strong political force. By the time Pen Sovann formally joined the Khmer People’s Revolutionary Party on July 27, 1958, much of the left-wing had been physically liquidated at the behest of Prince Sihanouk, and the remaining members fled either deep into the jungles or to Vietnam. Quite a few of those who survived to see the creation of the People’s Republic of Kampuchea in January 1979 claimed that Sihanouk was responsible for tens of thousands of deaths nationwide. While the era of “political struggle” was ending and fading into that of “armed struggle,” Pen Sovann had risen to the rank of major in the North Vietnamese Army and spent many years in military school and studying politics. By the time the peasant rebellions of 1967–1968 occurred, Sovann and many of his comrades in Vietnam, and within the Khmer Worker’s Party, opposed the political line of the more extremist elements of the Khmer Rouge. The Khmer Rouge supported, and some of their opponents claim stirred up, the peasants to a premature rebellion in Samlaut that was later brutally suppressed by the Cambodian government, which had been requisitioning rice from them to the point of starvation. This opposition was never forgotten by the Pol Pot loyalists who would later purge anyone they could without incurring the notice, displeasure, and wrath of the Vietnamese. Someone like Sovann could not be purged at that point, due to his rank and connections to Hanoi. However, by 1973 the Khmer Rouge would purge anyone they chose, believing the “armed struggle” was solely in their hands and not jointly shared with the Vietnamese. Although the Khmer Workers’ Party—later changed again in 1966 to the Communist Party of Kampuchea—maintained the façade of brotherhood with their Vietnamese counterparts up until full-scale war erupted in late 1977, there were many instances of violence between the two, often initiated by the Khmer Rouge.8 Throughout the 1960s there had been much support from the Vietnamese with military training, supply routes, and arms transportation. By the time the civil war kicked off nationwide in 1968, with the Communist Party of Kampuchea declaring the era of “armed struggle,” there seemed to be a solid bond of fraternity between the two parties.9In February 1970, Cambodian government forces began shelling North Vietnamese and National Liberation Front camps and bases in the country. The Vietnamese leadership was very confused by this due to Sihanouk’s agreement to allow them sanctuary. Unbeknownst to the Vietnamese, he had also reopened a diplomatic channel to the United States and had ordered local supporters of the Vietnamese killed beginning in 1968. Once the Cambodian government began openly attacking Vietnamese units in the east in 1970, the Vietnamese eventually responded in full force and by the end of 1970 had four North Vietnamese combat divisions in the country. While the war raged on inside Vietnam and also in Cambodia, the political war reached a climax with the coup d’état of March 1970 that firmly put Lon Nol in power and deposed Sihanouk. The Prince was enraged at the audacity of his appointed Prime Minister and immediately went into an alliance with the Khmer Rouge, who he had been ordering killed at every opportunity, and released his famous radio broadcast appealing to “his people” to take up arms against the Lon Nol government and join the Khmer Rouge. One day before the broadcast, Vietnamese Premier Pham Van Dong held a lengthy meeting with Sihanouk and gave his backing for the Prince’s desire to call for armed struggle.10 The Prince’s longstanding popularity with many of the peasants quickly brought in hundreds of recruits which were formed into the Vietnamese-trained-and-armed army known as the Khmer Rumdo, or Liberation Khmers. By late 1972, much of the initial Vietnamese aid, in the form of combat soldiers, was recalled back to Vietnam, leaving the Khmer Rouge and Khmer Rumdo to operate on their own. The Khmer Rouge also used that opportunity to disarm many of the Khmer Rumdo, purge Khmer returnees from Vietnam, and hold anti-Vietnamese demonstrations. When Khieu Samphan was asked by a North Vietnamese diplomat about the disarmament and killings, he replied that it was “a CIA plot.” By that point Lon Nol’s military force had been shattered by the North Vietnamese, and much of the countryside surrounding the cities was in the hands of insurgent armies. Pen Sovann stated that it was in “1970 when I returned to Cambodia that the Khmer Rouge leadership recruited me to work in radio which was broadcast out of Hanoi.” He worked under Chan Si, later his successor in the People’s Republic, and Khieu Thirith, the wife of Ieng Sary, in the Khmer Rouge’s Ministry of Information in charge of the Voice of the United National Front of Kampuchea.11 Because Sovann was working under the orders of the core leadership of the Communist Party of Kampuchea, he was forced to broadcast messages, appeals, and complete tasks he struggled with. “Their ideas were forced on me against my will. And they were against the cultural norms, as well! For example, not allowing the monks to fast as part of their Buddhist calling, forcing people to eat together in groups, and not calling your mother and father ‘mother’ or ‘father,’ but having to call them ‘friend mother’ or ‘friend father’. Ridiculous! Or husbands and wives calling each other ‘friend older brother’ or ‘friend younger sister.’ Those things do not fit with Khmer customs, and the things that were not according to Khmer custom, the real heart of the Khmer, I was against!” When asked if he ever openly criticized the party leaders he said, “Yes, openly. Openly! I pointed in the face of Ieng Sary and Ieng Tharith. At three o’clock in the afternoon on December 22nd, 1972, I said, ‘both of you are being treacherous to your nation!’”12Sovann knew at this time he could never return to Cambodia while the Khmer Rouge were in control of the party and it is fortunate that he was safe in Hanoi where the radio station was broadcast. 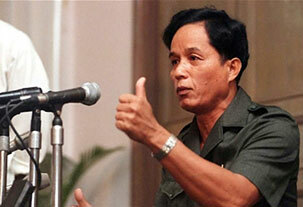 Pen Sovann was a founding leader of the Kampuchean United Front for Salvation on November 25, 1978. On January 1, 1979, the United Front, along with divisions of the People’s Army of Vietnam, invaded Democratic Kampuchea and freed the people from what the Front’s President Heng Samrin called a “neo-slavery regime that has nothing to do with socialism.” The liberation of the country from the “Pol Pot–Ieng Sary clique”—as the Khmer Rouge were called during the People’s Republic of Kampuchea, from 1979 to 1989—was concluded by January 7, now a national holiday. Most of the remaining Khmer Rouge soldiers were pushed deep into the jungle along the Thai border. Pen Sovann served as General Secretary of the Kampuchean Revolutionary People’s Party from January 5, 1979, until December 1, 1981, and Prime Minister from June 1981 until December 5, 1981 (which oddly enough was four days after he had been arrested and sent to Vietnam).16Although expressing gratitude to the Vietnamese for their cooperation and help, he consistently attempted to keep Le Duc Tho, the chief Vietnamese advisor to the new government of the People’s Republic, to his promise not to interfere in the internal affairs of Cambodia. Sovann says that Duc Tho’s promise was almost immediately broken and was a cause of tension between the two. * Carey McWilliams, Education of Carey McWilliams (New York: Simon and Schuster, 1979), 290. ↩Sovann claimed that Pol Pot returned to Cambodia from France with an ideology, focused solely on the role of the peasantry, that in time seemed to those involved in the anti-colonial struggle as akin to what later was frequently termed Maoism. ↩When Sovann was asked about Tou Samouth’s death he replied, “I know what happened to him, and the exact day he died, and how they tricked him. Pol Pot was responsible. Once he died there was infighting and killing for power.” This assertion is much in dispute. ↩Sovann claimed that Ieng Sary had a direct hand in Son Ngoc Minh’s death in China while he was undergoing medical care and this was the final blow to remove the “old guard” from the party and allow Pol Pot and his follower’s full control. ↩According to a September 1970 U.S. Central Intelligence Agency report, Khmer Rouge troops fired on Vietnamese forces from behind while the Vietnamese were engaging a Lon Nol unit in Kompong Thom. ↩A few days after that fateful broadcast was made, Vietcong units moved into Eastern Cambodia playing the recorded message in villages and distributing leaflets of Sihanouk’s appeal. ↩The “violations of cultural norms” that Sovann protested against were not formally the party line at the time he led the radio project. ↩Both political parties maintained formal relations up until 1977. ↩Sovann claims that his arrest was due to his “strong stance about Khmer self-reliance” and the fact that this was an irritation to Le Duc Tho. ↩Sovann told the Cambodia Daily in 1997 that he holds two party leaders at that time, Hun Sen and Say Phouthang, responsible for his imprisonment.